RUR Cup holders Chichester are out of the competition after first half goals from Alex Laing and Karl Akehurst ensured there would be no trip to Culver Road this season. City gave their hosts from step four a real test however and bosses Miles Rutherford and Graeme Gee will take positives from the game. Chichester are no strangers to heartbreak at Hanbury Park having lost twice there last season in cup competitions. A 1-0 defeat in a close match in the Sussex Cup in October 2017 was settled by a controversial goal and followed by a 2-1 Peter Bentley Cup loss in February 2018 when Heath got the winner late on. Chi battled hard with ten men for over half an hour in last year’s SCFL premier division encounter only for the Blues to nick all three points in the sixth minute of time added on when Harry Williams deflected a cross into his own net. 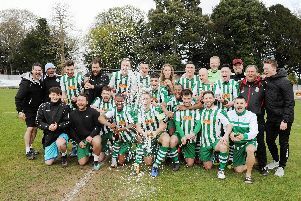 That win sent Haywards Heath top and added momentum to a campaign that saw them finish champions, sealing the league title in emphatic style at Oaklands Park at the end of April. This time the visitors were without leading scorer Scott Jones, Dave Herbert and the suspended Gicu Iordache together with a number of injured players. Rutherford and Gee named under-18 players Theo Bennetts and Luke Wallis on the bench and gave a debut to Roman Krumphoiz. The hosts came into this semi-final seventh in the Bostik South East division but there was little to choose between the sides in the opening exchanges. Chichester, in a fine run of form with just one loss in 13 games in all competitions, had a bit of defending to do in the first ten minutes as they acclimatised themselves to a direct style of play. Sean Roddy, Bryon Napper and Andy Dalhouse all missed opportunities to get shots off on target as Heath pressed, while at the other end Connor Cody drove into the box but drilled his effort just wide. City settled and Kaleem Haitham started to cause trouble down the left flank. The winger was involved in some lovely interplay with Rob Hutchings only for a Heath defender to divert his cross for a corner. This came out to Matt Axell who got a shot away but again a defender managed to block. Haitham was then brought down after a clever one-two with Axell. He rolled the free-kick to Josh Clack but keeper Josh Heyburn did well to get down low and hold on to Clack’s fierce drive. Cody opened up the hosts’ midfield again moments later and fed the ball towards Clack but the Chi No.7’s touch was too heavy. Haitham tried his luck from distance before Heath’s Callum Saunders threatened after he charged down a pass from Ben Pashley. Jordan Matthews was called on to make his first save on 25 minutes but Akehurst’s attempt did little to trouble him. Clack and Haitham then combined in a flowing attacking move only for the ball to run on as Clack jinked into the penalty area. Heath went ahead in the 28th minute through Laing when he beat Matthews to get to Melford Simpson’s knock-on and slotted the ball into the empty net. Akehurst almost doubled the lead from a corner but his header must have brushed off a Chi player because referee Owen Radley signalled another. Saunders changed things up and went short and Akehurst steered in Simpson’s cross to make it 2-0. Latest signing Krumphoiz, up top in place of Jones, had a couple of chances to pull Chichester back into it five minutes or so before the interval. The German went close with a header and then couldn’t quite bring down a super cross from Haitham after a well-timed run. Pashley had to react quickly with a fine tackle after a mistake by Hutchings to turn the ball out for a corner before Matthews gathered Laing’s cut-back that flicked off a player and might have wrongfooted him. And there was still time for Laing and Saunders to link up after the ball broke kindly but the final shot was wide of the mark. Laing had the first opportunity of the second half only to find the side-netting. Next Krumphoiz, Clack and Cody were involved in a slick move that gave Heath defenders something to think about. The Heath back four was in no mood for charity however and coped well enough with all the visitors threw at them in a spell of pressure - Haitham’s cross was just too strong for other forwards after a precision pass from Pashley sent him off on another run; Axell then dragged a shot on the turn inches wide; and Ross Edwards just over-hit a ball for Krumphoiz, who impressed on the night. Then Napper almost caught Matthews out with a long range effort. Simpson also made Matthews work with a header into his gloves before an unmarked Dalhouse should have done better with 15 minutes to go. Heath had a real chance to bag a third late on when they were awarded a free-kick in the box after a scramble ended with a Chi player passing the ball back to Matthews. Matthews spilled the shot from the set-piece and as Matthews claimed the ball in the resulting melee Saunders was red carded rather harshly for a foul on Axell. Chichester are back in semi-final action next month when they face Saltdean United for a place in the Peter Bentley Cup final. Before that there are other challenges for the league leaders. Next up is a trip to Broadbridge Heath on Saturday (3pm). Chichester: Matthews, Peake, Hutchings, Axell, Cody, Pashley, Clack, Biggs, Krumphoiz, Edwards, Haitham. Subs: Bennetts, Wallis, Ndlovu, Callnon.